Driving home from the morning run to school I recognized the familiar plume of smoke that shouts Fire. Here in Santa Barbara we’ve become all too familiar with the symptoms and realities of forest fires. I returned home, had breakfast, opened up my computer and there was the emergency email from the County, providing a bevy of details. Emails came about every half hour and were full of specifics–how many engines were headed up the mountain, how many helicopters and air tankers, how many men on the ground. They were going to throw all their resources at this blaze to catch it now–on maybe the hottest and most dangerous day in October. I said a quick prayer for friends who live in that exact place. But here at my home, with the fire several miles away and the winds calm, I went about my day. And that meant bread baking. I knew things were off in my head when I discovered I was almost out of flour but decided to bake anyway! The rest of the white flour went into the mix, then some garbanzo bean flour, a little honey and milk, some yeast, grind up some kamut, and, OH!! !, why not grind some oats while you’re at it! Was I crazy? Back to email. Back to fire updates and fiddling with stories, and sweeping up pine needles. Before I knew it the dough had risen risen risen, risen way too long and the shaped rolls were looking desperate and wrinkled and forgotten. Into the oven anyway! 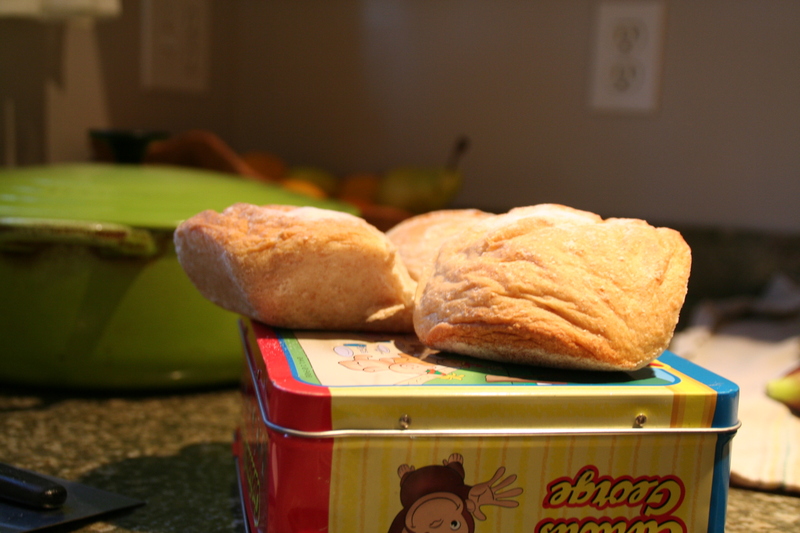 And again, lost in some other time zone I forgot the oven was hot, and that the rolls were done. Over baked; it was just one of those days. To save it all, despite the bizarre concoction of grains and what not, John Ronan came home from school wanting toast with fig jam. Of course! I said. And rhubarb jam, he said. Of course! I said again. I was thrilled–the child doesn’t even like figs or rhubarb. And believe it or not, the whole dinner gang loved the bread, wrinkles and all. Distractions don’t always make something turn out lovely, but I suppose it doesn’t mean they can’t at least be tasty! So, here’s to all of you who get distracted from time to time like I do. Part of life, part of being human. But forgive me for not sharing the bread. I just couldn’t. Look at it–would you have shared? And the fire is close to containment. Thank you for your prayers! No excuses of that sort today. Time to get back to baking (with not quite so many ingredients…). This entry was posted in On Baking and tagged crazy, distracted, distracted by fire, fire, rolls by janegmeyer. Bookmark the permalink. What is the website you got your fire updates from? And remind me not to read your blog right before lunch, I had to keep myself from licking the computer screen and I bet my coworkers would think that odd.